“I told them about you bro. They saw you and they’re stoked,” admitted Mötley Crüe drummer Tommy Lee to future lead vocalist Vince Neil the night the band came out to see the bleached blonde singer perform with his band Rock Candy at the famed Hollywood nightclub Starwood. Neil, however, was apprehensive at first, as he was very happy with his current band, but agreed to an audition the next weekend in order to not hurt Lee’s feelings. The singer was quickly ushered into the band, and for the next decade the Crüe embarked on a heavy metal odyssey full of music, mayhem, and four consecutive multi-platinum albums. 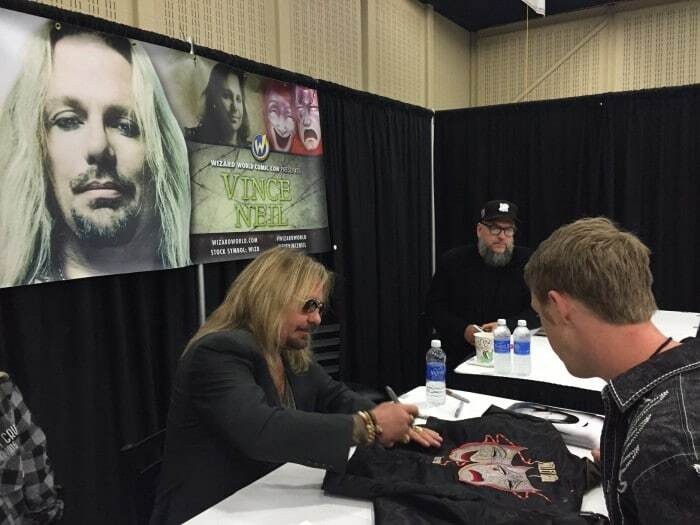 International superstar, accomplished businessman and heartfelt philanthropist, Vince Neil came to exemplify all things rock and roll: the sound, the success, the look and the outrageous lifestyle. Vince’s unmistakable voice leads some of the greatest rock songs of this generation including “Shout At The Devil,” “Home Sweet Home,” “Girls, Girls, Girls,” “Dr. Feelgood,” “Kickstart My Heart,” “Same Ol Situation,” and “Saints of Los Angeles,” which was nominated for a Grammy Award in 2009 for Best Hard Rock Performance. With fifteen years between his last solo album, Vince Neil releases Tattoos & Tequila on June 22, followed by his tell all book of the same name later in the fall. When not performing, Vince Neil continues to expand and oversee his latest entrepreneurial efforts which include Feelgoods Rock Bar and Grill in West Palm Beach and Las Vegas; Vince Neil Ink, a Las Vegas based tattoo parlor and apparel shop with two locations — one on the Las Vegas strip and one in the Rio Hotel & Casino; Tres Rios tequila, a high quality, authentic Mexican tequila created from the finest Agave in Guadalajara Mexico; The Skylar Neil Memorial Foundation (www.skylarneil.org), a tribute to Vince’s daughter whom he lost to cancer in 1995 which has raised over $2 million to help combat childhood cancer and his latest venture, Vince Neil Aviation, a luxury air charter service providing the the rock n’ roll commute on either his Lear 35 or Hawker 700 jets. Raised on the tough streets of Compton, California, Vince Neil fell in love with music as a child, developing a broad vocabulary that ranged from classic Motown to hard rock. As a teenager, he began performing with local bands and soon discovered both a passion for the stage and a natural talent as a singer and performer. He fronted the popular band Rock Candy before reuniting with high school buddy Tommy Lee in 1981, sealing rock and roll history with the formation of Mötley Crüe. In addition to selling 80 million records around the world as the badass frontman for Mötley Crüe, Vince Neil also began his career as a solo artist in 1993. Vince’s Top 200 Billboard albums, Exposed (which reached number 13 on The Billboard 200 albums chart) and Carved In Stone have spurred the hits “You’re Invited (But Your Friend Can’t Come)” (co-written by Vince with Jack Blades and Tommy Shaw), “Can’t Have Your Cake” (co-written by Vince with Steve Stevens) and “Sister Of Pain” (co-written by Vince with Jack Blades and Tommy Shaw).